Following are the steps to follow to solve Tower of Hanoi problem recursively. Let the three pegs be A, B and C. The goal is to move n pegs from A to C.
The recurrence function T(n) for time complexity of the above recursive solution can be written as following. 2) Consider the directed graph shown in the figure below. 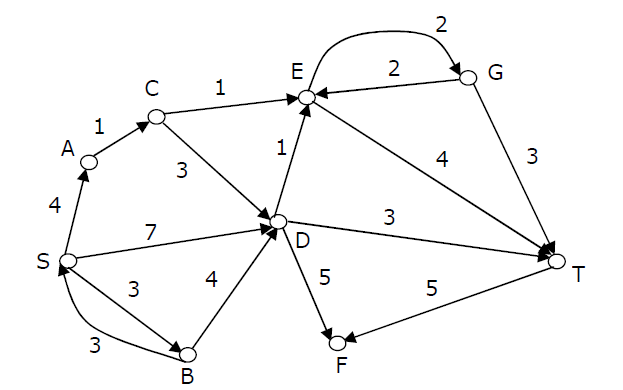 There are multiple shortest paths between vertices S and T. Which one will be reported by Dijstra?s shortest path algorithm? Assume that, in any iteration, the shortest path to a vertex v is updated only when a strictly shorter path to v is discovered.